Cercle de Franconie qui comprend les Eveches de Wurtzbourg, de Bamberg et d'Aichstet; les Marquisats de Culmbach et d'Anspach; et les Comtes d'Henneberg, d'Hohenlohe, de Vertheim, de Reineck, d'Erpach etc. 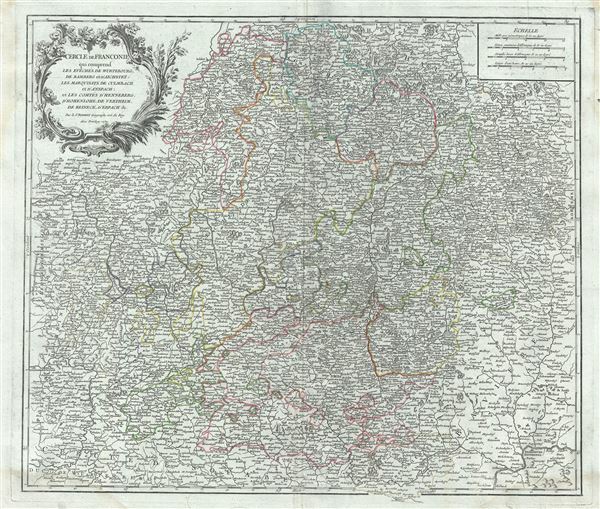 This is a fine 1752 map of the Circle of Franconia, Germany, by Robert de Vaugondy. Centered on Bamberg, Wurtzburg, and Nuremberg, it covers from Arnstadt south to Regensburg and from Frankfurt east to Plauen. Includes the important mediaeval and renaissance center of Nuremburg. Today Franconia is a historic district and has been consolidated with Bavaria. The entire region is depicted in extraordinary detailed, offering both topographical and political information, with forests and mountains beautifully rendered in profile. The 'circles' of Germany are the 'imperial circles,' administrative units created for tax and defense purposes by the Holy Roman Empire, of which these areas were a part. The Napoleonic Wars would, of course, dissolve the Holy Roman Empire and lead to the consolidation of Germany in 1871. This map was originally engraved by Catherine Haussard, one of the few female engravers active in Paris during the 18th century. A beautiful title cartouche adorns the top left quadrant of the map. Issued in the 1757 issue of the Atlas Universal. The Atlas Universal was one of the first atlases based upon actual surveys. Therefore, this map is highly accurate (for the period) and has most contemporary town names correct, though historic names are, in many cases, incorrect or omitted. Rumsey 3353.063. Pedley, Mary Sponberg Belle et Utile: The Work of the Robert de Vaugondy Family of Mapmakers, 269.